Following the previous '80s post I could think of no other band to introduce than Nouvelle Vague. You might have bumped into them before, I think their music has been featured in a range of TV series and adverts. 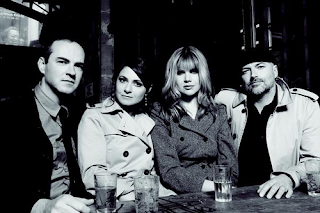 Nouvelle Vague is actually a cover band which you might not notice at first - they truly make all the songs their own. The French band combines French chanson with bossa nova arrangements. The name 'Nouvelle Vague', which translates into 'New Wave' in English, also refers to the type of music the cover: the '80s new wave. Covering songs from all your punk, post-punk and new wave icons, you've probably heard some of the originals before. I'll keep this one short and sweet and let the music do the talking. It makes you want to lead a bohemian lifestyle in the Rive Gauche of Paris and drink red wine all day long. Quite nice. The playlist starts off with a playful cover of "Dancing With Myself", originally recorded by Billy Idol's Generation X band in 1980. Even in the first song you can really hear how different their versions sound from the original versions, which is excellent - you can tell they're not cashing in on the songs, which are often well-known classics. Well this one's obviously one of Blondie's. As you'd probably guess. This one makes an interesting cover of New Order's massively sampled club anthem. Again, quite like with "Israel", a distinctive bassline is removed without any harm done. It might actually be better that way: after all, the biggest failure one can do while covering a song is trying to sound too much like the original. No, it has nothing to do with One Direction. Nothing. Instead, it's Nouvelle Vague's feel-good take on The Undertones' 1978 hit. Did you know that the 1982 Modern English single is actually about a couple making love as nuclear bombs fall from the sky? Puts the lyrics in a new light, doesn't it. Now this one's a one you all know. I'm talking about the original version obviously. Which was also included on my previous '80s playlist. So of course you'd recall the song by know. Right? Also one you should remember by now. In case you don't, it's originally by The Lords of the New Church. One of Nouvelle Vague's best, actually. Yes, it's Depeche Mode. Yes, it's weird how good it sounds even without the synth riff. Yes, it's the same as in "Israel" and "Blue Monday". Yes, I'll get on with this. Another highlight of their career. Originally an uptempo punk rocker, the song is remade in a trademark Nouvelle Vague style. Well that's about it, then: those are the songs, here is the playlist. Do enjoy.